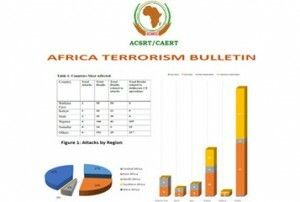 The African Centre for the Study and Research on Terrorism (ACSRT) in its bi-weekly “Africa Terrorism Bulletin” has recorded a total of 614 terrorism related deaths in Africa between the period of 1-15 January 2019. Out of the 614 terrorism-related deaths, 190 were killed by direct terrorist attacks whereas 424 were killed during counter-terrorism operations by security forces. The Sahel region recorded 90% of the terrorism-related deaths. The incidences of terrorist attacks across Africa at the end of 2018 especially in December and in January 2019 have become a source of worry to many stakeholders. The Horn of Africa, the Lake Chad Basin, the Maghreb, the Sahelo-Sahara and the Central Africa regions are currently the most affected. The situation in these regions has evolved into one of asymmetric warfare in which, in some cases, terrorist groups occupy portions of national territories, recruit members from local communities and run criminal economies for their benefit and that of local communities sympathetic to their cause. 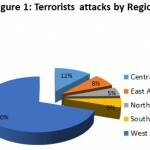 The Africa Terrorism Bulletin, a fortnightly compilation, and analysis of terrorism-related incidents in Africa, reveals that Seventy percent 70% (425) of the casualties of terrorist incidents during the first 14 days of 2019 were members of terrorists/insurgent groups. Civilians and Security forces casualties were 26% and 4% respectively. Boko Haram and Al-Shabaab killed 38 and 22 persons respectively in their attacks, the report added. The Bulletin further reveals that, in 12 out of the 19 attacks, the terrorists used Small Arms and Light Weapons. Explosives were used in 5 of the attacks while mixed weaponry and kidnapping accounted for one each. 10 of the attacks targeted civilians, 6 targeted security personnel, 2 targeted Government institutions while 1 targeted an International Organization. Five countries most affected by terrorism during the period were Burkina Faso, Kenya, Mali, Nigeria, and Somalia. The bulletin further indicates that Security forces have remained responsive to the situation. Counter Terrorism Operations have been significant in January 2019. 395 members of Boko Haram have been killed in CT Operations. These include 287 killed in Niger between 28th December 2018 and 2nd January 2019. In Nigeria, 100 Boko Haram members were killed in Borno and Yobe States on 7th January 2019. Similarly, the security forces in Kenya successfully eliminated all the al- Shabaab militants who attacked the DusitD2 hotel and rescued over 700 civilians. 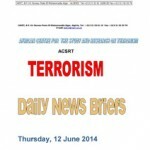 As part of its mandate to help build Counter Terrorism capacity of African Union Member States, and keep African Counter Terrorism Practitioners abreast with current trends of terrorism in Africa, the African Centre for the Study and Research on Terrorism (ACSRT) has developed tools that allow it to collect, analyze and disseminate terrorism-related incidents in Africa. 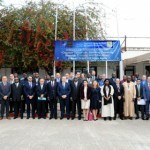 The information gathering, processing, and analysis allow the ACSRT to provide Member States and P/CVE Practitioners with relevant information on trends and development of terrorism in Africa. The ACSRT disseminates its trend analysis through various productions. The Africa Terrorism Bulletin, a fortnightly compilation, and analysis are to form the basis for an African Terrorism Trend Analysis to be published by the Centre quarterly. The objective of the Africa Terrorism Bulletin is to provide a fortnight assessment and analysis of terrorism situation and trends on the continent. 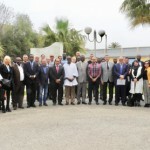 This is aimed at providing African Union Member States up to date information and understanding of terrorism incidents and its related activities. The next edition of the Africa Terrorism Bulletin will cover terrorism incidents from 16th January to 31st January 2019.